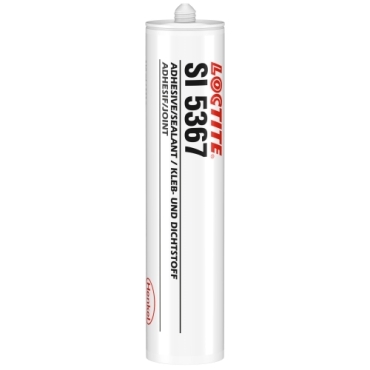 Loctite SI 5367 - 1-part, white, industrial acetoxy silicone sealant/adhesive. Its flexibility means that load bearing and shock absorbing characteristics of the bond area are enhanced. LOCTITE® SI 5367 is a 1-part, white industrial acetoxy silicone sealant/adhesive which has been designed specifically to ensure perfect sealing, as well as bonding and protection. Typical applications include sealing side windows in trains, sealing heat sources (ovens, heat exchangers, steam circuits, water heaters), providing protection/insulation of electrical boxes, bonding of HCR silicones and general maintenance. It offers high elongation at break of 500%.